The BSE Sensex ended with a loss of 215 points at 24,685 The BSE Sensex opened at 24,998 touched an intra-day high of 25,013 and low of 24,647. The NSE Nifty closed with a loss of 68 points at 7,546. The NSE Nifty opened at 7,630 hitting a high of 7,631 and low of 7,536. The India VIX (Volatility) index was down 2.99% to 16.8250. The Indian Rupee was trading down by 20 paise at 66.65 per US dollar. On the global front, China's Shanghai Composite index closed down 1.4% and Hang Seng up 0.29%. In Europe, the FTSE 100 down 0.12%. On the other hand, DAX and the CAC 40 trading lower by 0.4% each. BHEL, Coal India, Lupin, Aurobindo Pharma,Dr.Reddy's, ONGC and Cipla were among the gainers on NSE, whereas Tata Power, Adani Ports, Maruti Suzuki, HDFC, L&T and ITC were among the losers today. Out of 1,805 stocks traded on the NSE, 921 declined and 611 advanced today. A total of 34 stock registered a fresh 52-week high in trades today, whereas 18 stocks touched a new 52-week low on the NSE. At 2:57 PM, the S&P BSE Sensex is trading at 24,728 down 172 points, while NSE Nifty is trading at 7,556 down 58 points. 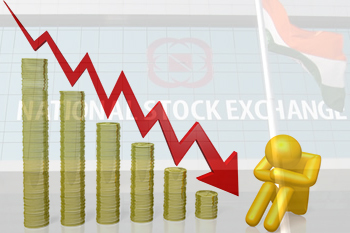 The BSE Mid-cap Index is trading down 0.26% at 10,546, whereas BSE Small-cap Index is trading down 0.11% at 10,629. Dr.Reddy's, Lupin, Sun Pharma, Axis Bank, ONGC, Cipla and Coal India are among the gainers, whereas Maruti Suzuki, HDFC, Adani Ports, Infosys, ITC, L&T, Bajaj-Auto and Asian Paints are losing sheen on BSE. Some buying activity is seen in pharma, energy, oil and gas and realty sector, while consumer durables,FMCG,auto, IT, power and telecom are showing weakness on BSE. The INDIA VIX is down 2.11% at 16.9775. Out of 1,805 stocks traded on the NSE, 840 declined,682 advanced and 283 remained unchanged today. A total of 34 stocks registered a fresh 52-week high in trades today, while 14 stocks touched a new 52-week low on the NSE. HDFC slipped 2.4% to Rs.1,075. The stock is top Nifty losers. The company proposed to make an additional one-time special provision of Rs. 450 crore during the quarter ending March 31, 2016, which is subject to board approval. Biocon jumped 1.7% to Rs.540 on BSE. The stock is trading on a 52-week high on BSE. Biocon Chairperson Kiran Mazumdar-Shaw on Wednesday sought a five-year exemption from drug price control and asked the Government to refrain from announcing “ad hoc” measures to help the pharmaceutical sector become globally competitive. “When we are trying to invest in expansions, scale up and creating global scale, we need exemption from price control at least for a period of five years… This will incentivise investments in our sector because I really believe that this sector is trying to build global scales,” Shaw said at the Board of Trade meeting in New Delhi. Delta Corp Ltd stock was higher by 10% at Rs.836. HDFC Bank Ltd., signed an MoU with the Indian Navy to offer Salary account to Navy personnel. As a part of the Defence Salary Account offering, Navy personnel, currently in service as well as retired, will get access to HDFC Bank’s world-class banking services and a suite of digital banking products, offering convenience and access. HDFC Bank Ltd is currently trading at Rs. 1053.6, down by Rs. 7.9 or 0.74% from its previous closing of Rs. 1061.5 on the BSE. Bharat Heavy Electricals Ltd gained 1.5% to Rs.115.90. The board of the company is scheduled to announce Q4 result today. Sundram Fasteners Limited, a flagship company of the TVS Group, has restructured its international operations in order to maximise the revenue potential and shareholders' value. The stock is currently trading at Rs. 173.05, up by Rs. 7.7 or 4.66% from its previous closing of Rs. 165.35 on the BSE. Ricoh India slumped 5% and is trading at Rs. 336. Manoj Kumar has resigned from the Board of Directors of the company with effect from April 02, 2016. He had been asked to go on leave on March 29, 2016 by the Board of Directors. Future Retail Ltd stock was higher by 5% at Rs. 135. The company has executed a binding term sheet for sale of 14% stake (including approx. 1.25% holding of management team) of Future Supply Chain Solutions Limited ('FSCSL"), a subsidiary of the Company to SSG Capital Management Group. Ashoka Buildcon Ltd stock was lower by 6% at Rs. 128.Yesterday, the stock had hit 20% lower circuit. Sobha Ltd stock was higher by 4% at Rs. 281.The company has registered new sales area of 3.38m sq ft valued at 20.12bn at an average price realisation of Rs. 5946 per sq ft.
MEP Infrastructure stock was up by 2% at Rs. 40. The company in a joint venture (JV) with its Spanish partner has received Letters of Award (LOAs) for Rs.1762.98 Crores from National Highways Authority of India (NHAI) and Ministry of Road Transport and Highways (MORTH).